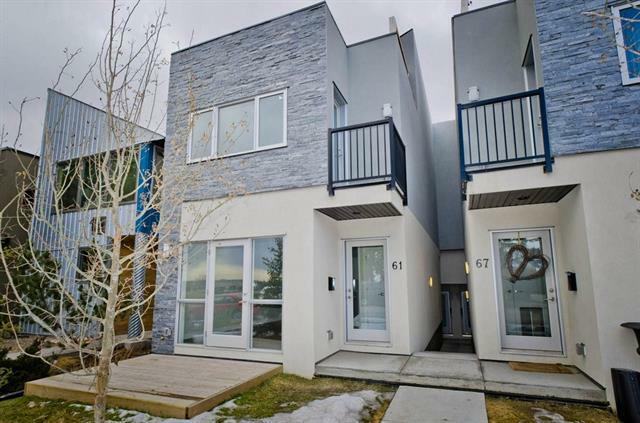 Welcome to the community of Erlton, one of the last affordable inner-city neighborhoods, a true hidden gem. Access to the river pathways, downtown, Repsolsport center, the c-train or the stampede grounds is all a stone's throw away. These recently built 2.5 storey townhomes were uniquely designed to prevent sound transfer. Each unit has beautiful modern finishings and practical layouts. Upstairs you'll find 2 bedrooms, a third floor loft with skylights & vaulted ceilings, and a roof top patio with downtown views! The master bedroom has a full en-suite. Open concept main floor with kitchen featuring quartz counters, stainless appliances, and plenty of cabinet & counter space. The living room features floor-to ceiling windows. One parking spot in the detached garage is included.